Nigeria’s female table tennis player, Tosin Oribamise, has made appreciable ascent in the January ranking of the International Table Tennis Federation. The News Agency of Nigeria reports that Oribamise moved from 728 to 486 spot. The 300-level student of Ekiti State University described the remarkable development as “a wake-up call”. Oribamise said that she was not amazed about her ranking because she ought to have done better. “This ranking means I still have lots of work to do on myself to be where I want to be. I’m nowhere near where I’m targeting but I know it’s a gradual process. “I’ll work harder this year so I’ll be able to make a better progress in my ranking,” she said. Oribamise, however, appealed to the Federal Ministry of Youth and Sports to ensure that table tennis players attend more international competitions in 2018. “When we train so hard we need an avenue to put into practice what we have trained for. We can’t continue to compete among our fellow home based players. “We need regular international competitions to sharpen our competitiveness. “These international competitions will also help improve our ranking,” she said. 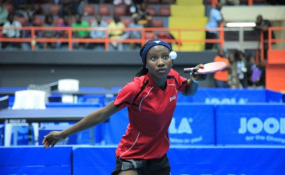 NAN reports that Oribamise came into the limelight in 2010 after she was discovered by Bode Ajayi, the Head Coach of Ekiti State Table Tennis Association. Oribamise represented Nigeria at the 2016 World Junior Championships in South Africa. She was also at the World Junior and Cadet Circuit in Egypt 2015 where she won two gold, one silver and two bronze medals. The tennis star was at the Africa Junior Championships in Algeria in 2016 and won one silver and three bronze medals.